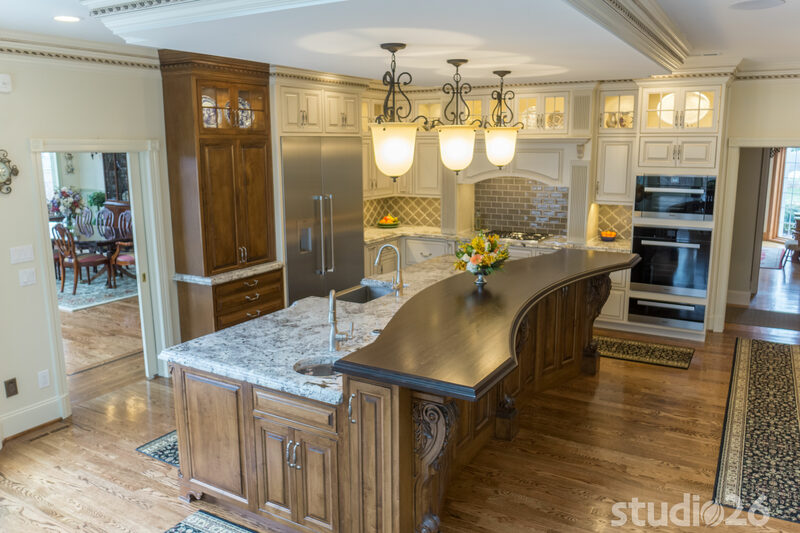 After our client initially worked with a few kitchen designers without the results they were seeking, our firm was fortunate to receive the call from some great folks to help them completely update and transform their kitchen, sunroom, dining room, and living room. 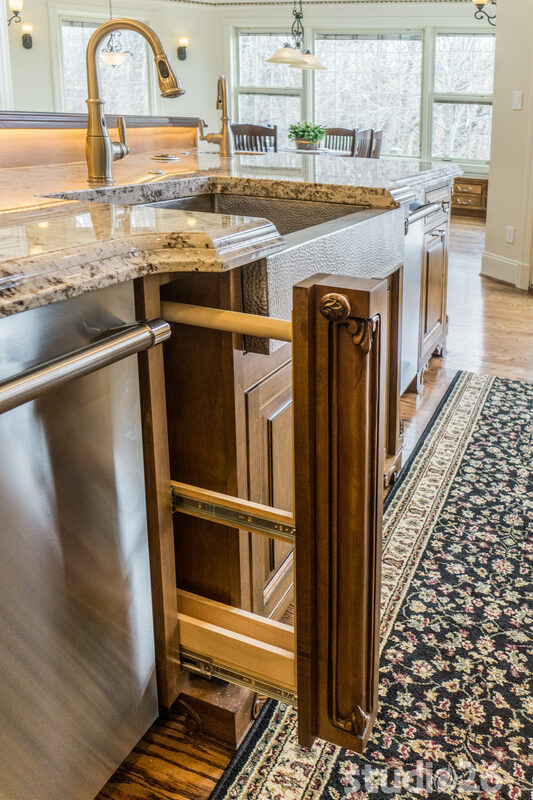 With their adult kids’ families nearby and the number of grandchildren growing, hosting family events all together during the holidays and special occasions was starting to become increasingly more difficult for our client. 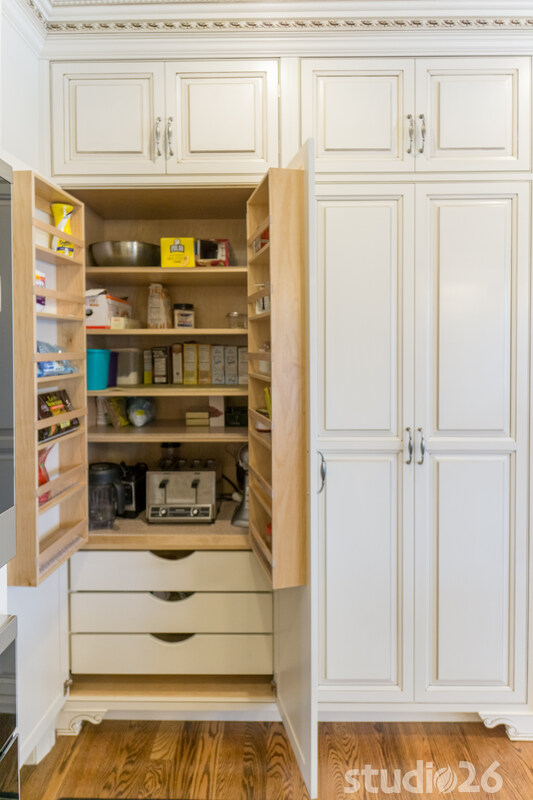 As a result, we were asked to help them design and reimagine four previously separate spaces into two more open and quite functional spaces to better meet their growing family’s needs. 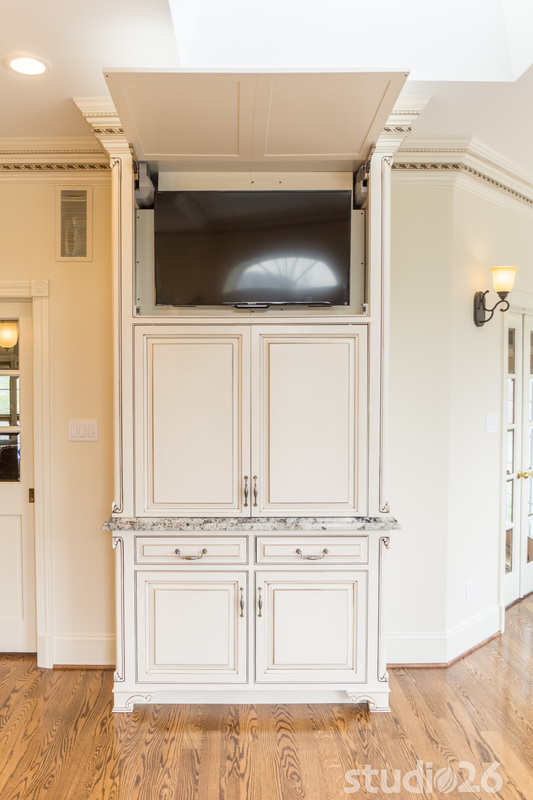 From a spatial planning standpoint, we were able to work through a design that helped to better unify the home as a whole and create two preeminent spaces from four smaller compartmentalized rooms. 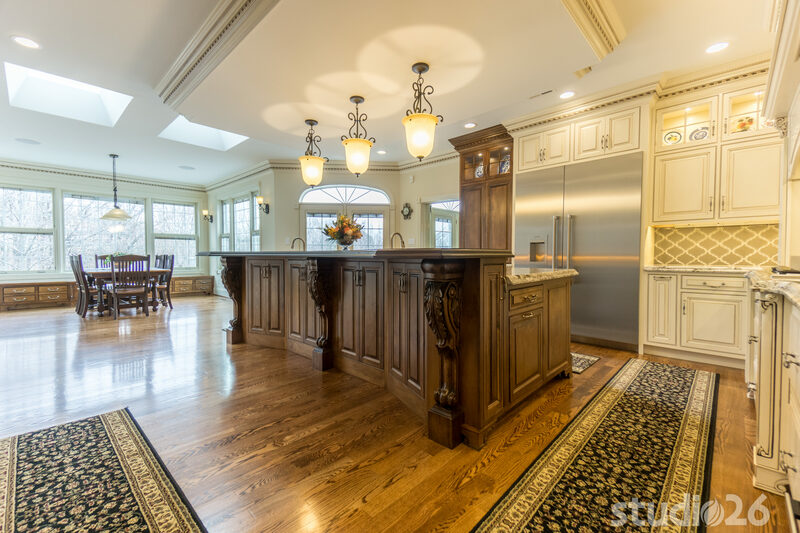 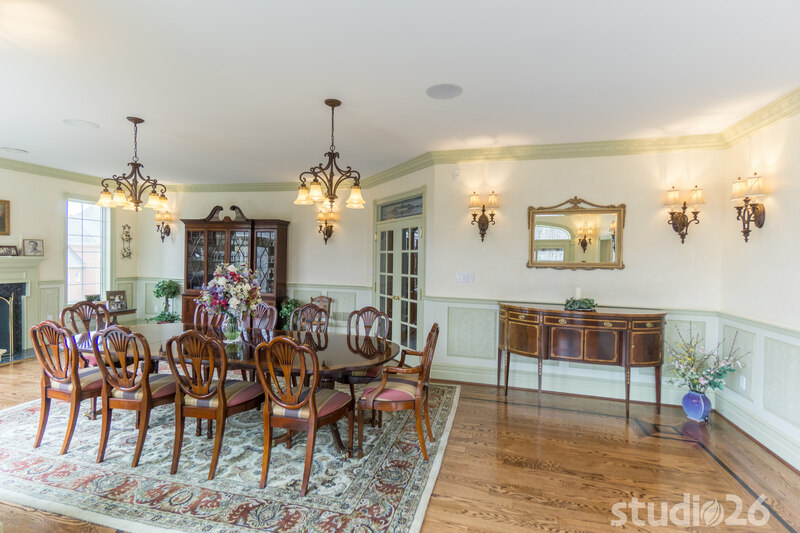 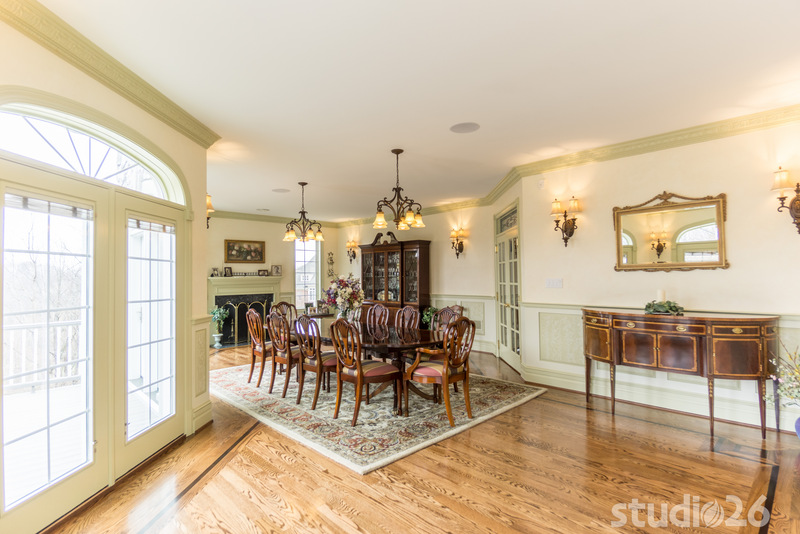 The former dining room and living room were transformed into one large, stately formal dining room; and the former kitchen and sunroom were transformed into one large, elegant kitchen and breakfast nook area – all much more suitable for their grand family gatherings. 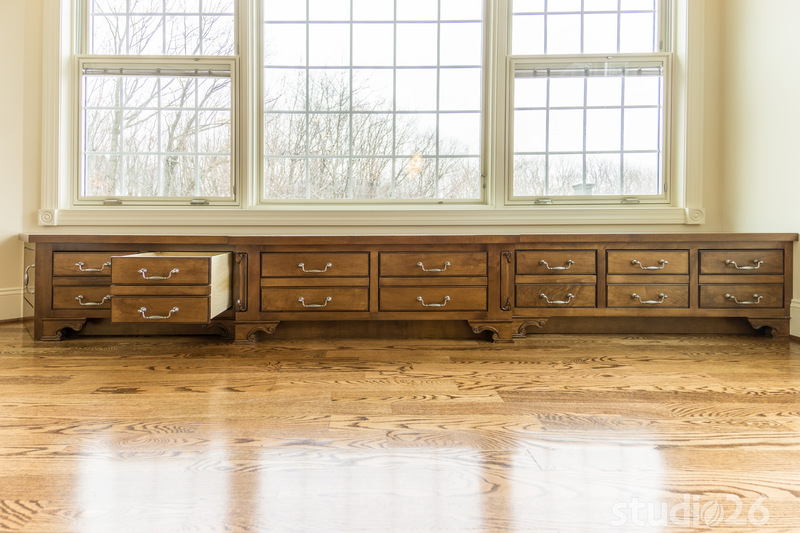 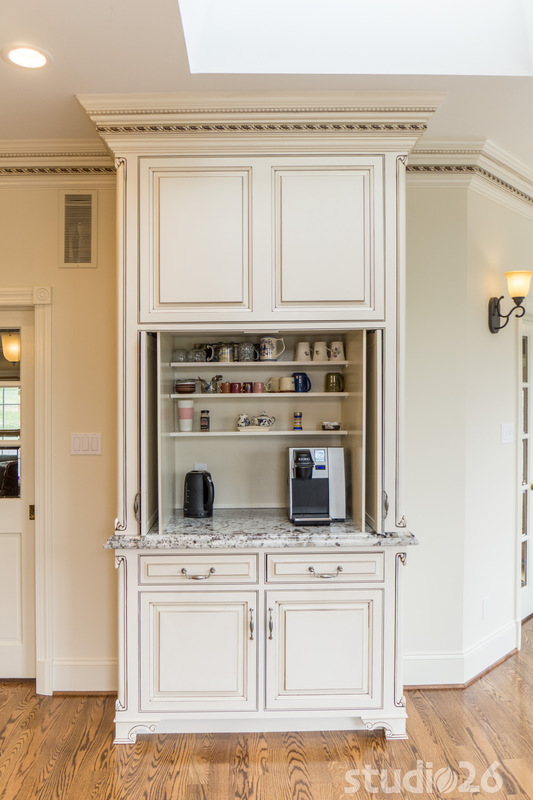 In addition to removing critical load-bearing walls to open up each of the spaces, there were additional details that needed to be executed to carry out the design intent. 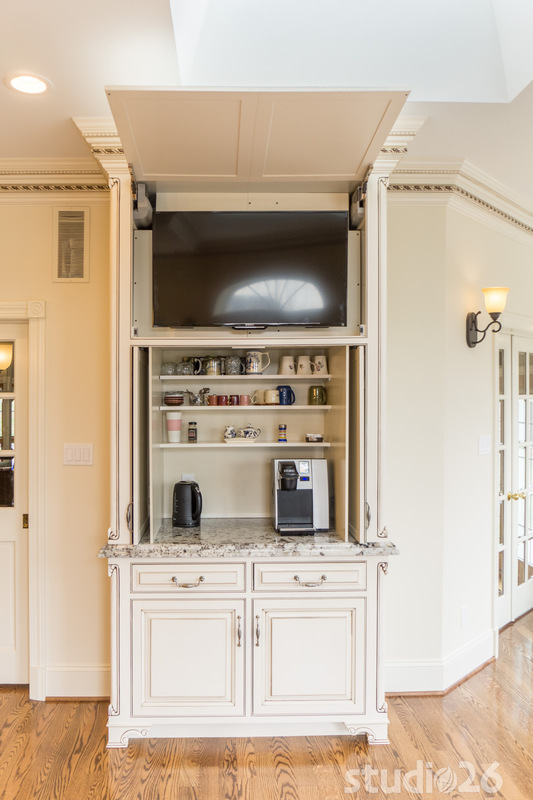 For example, in the former sunroom, our firm had to raise up the floor to meet the existing floor level and demo the existing roof so that we could build new walls and a new roof to match the higher ceiling plane in the existing kitchen to help the newly created space feel more contiguous and spacious. 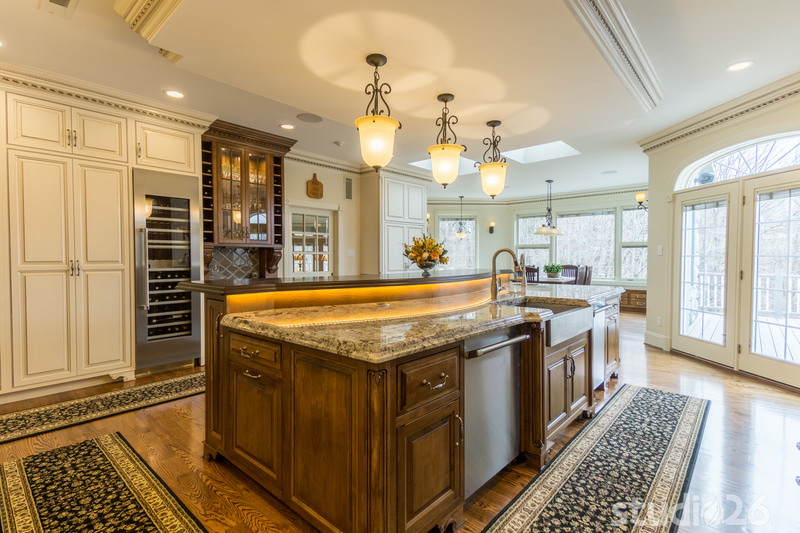 Another notable task was performing the necessary ‘gymnastics’ in ductwork to allow us to relocate the gas cooktop and required ventilation per the new desired kitchen layout. 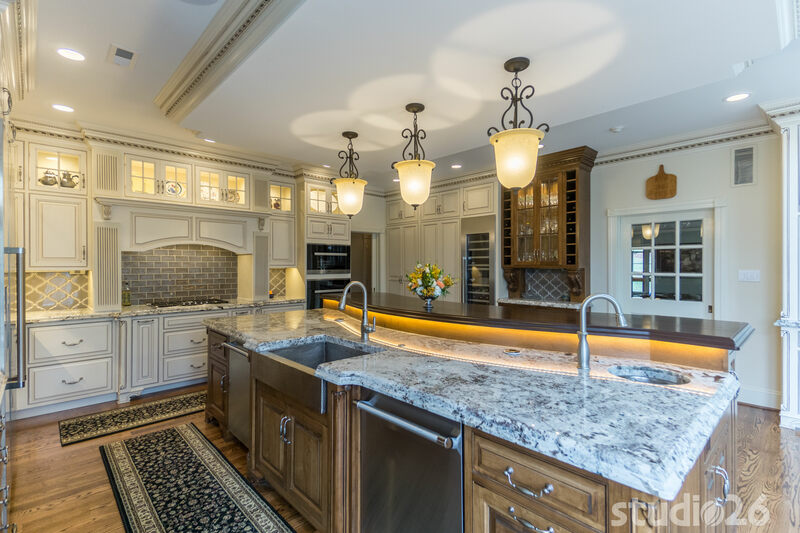 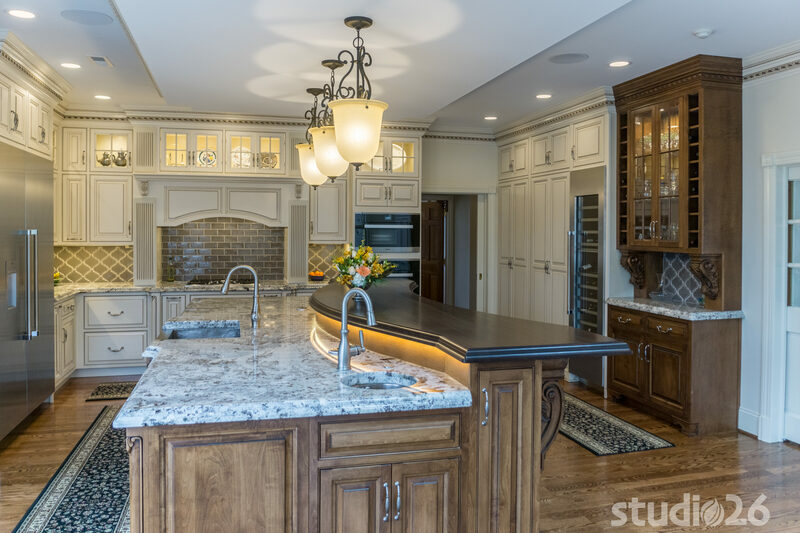 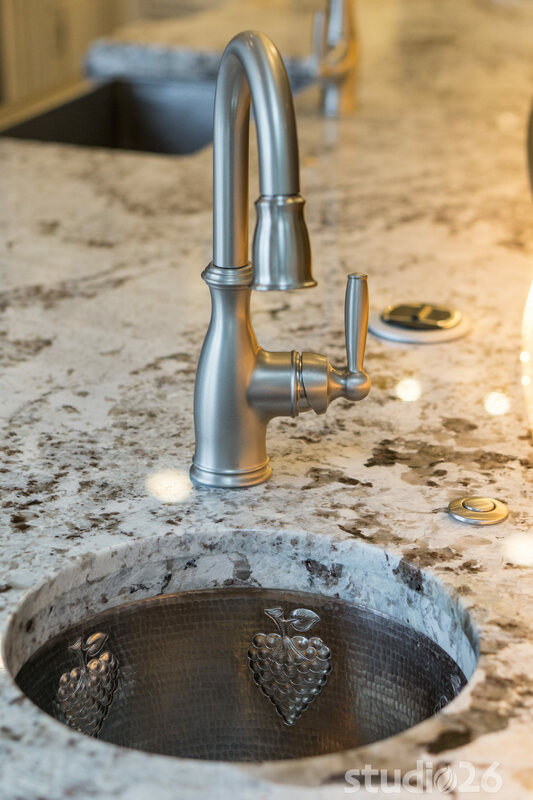 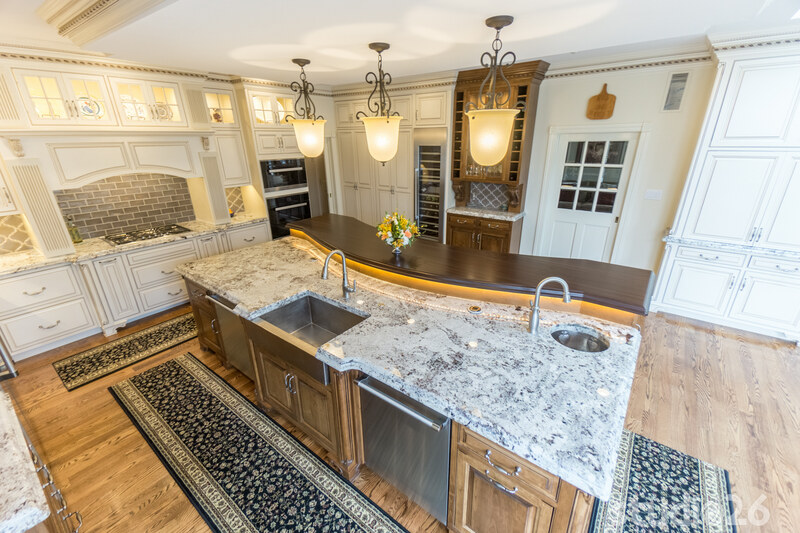 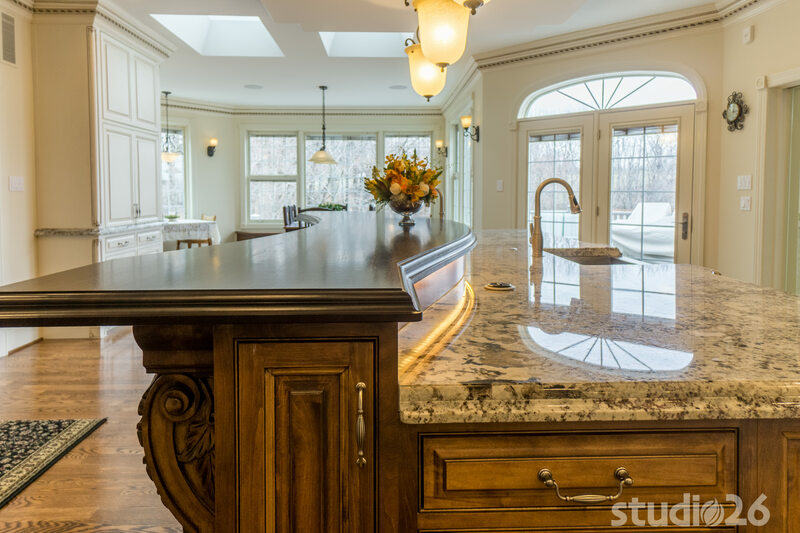 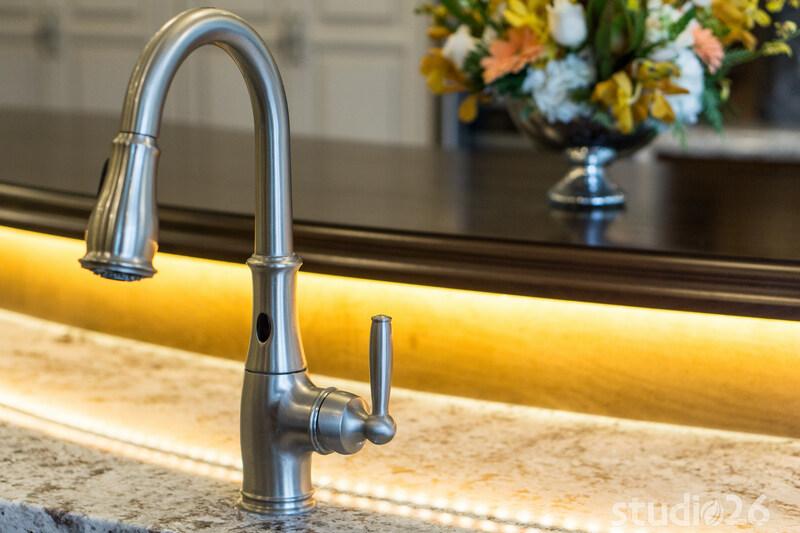 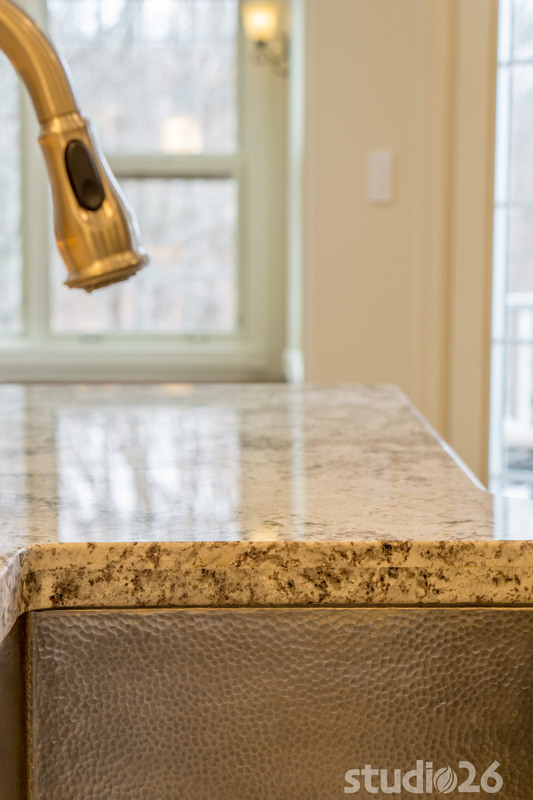 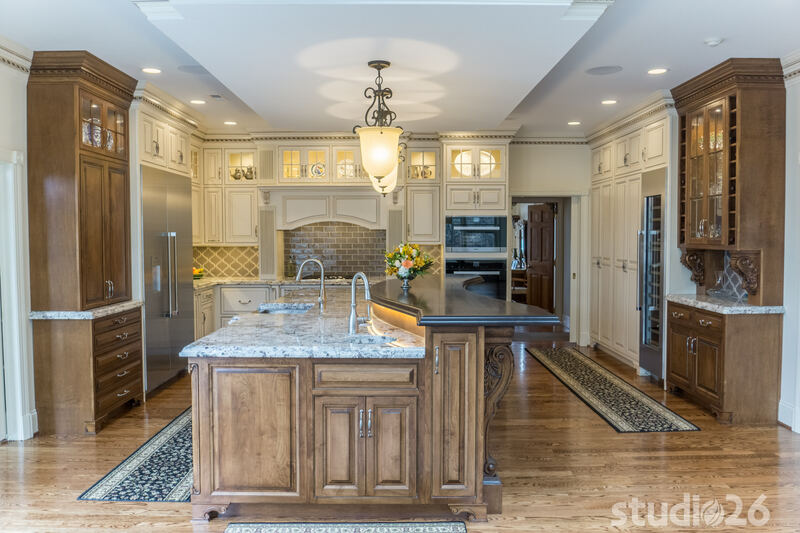 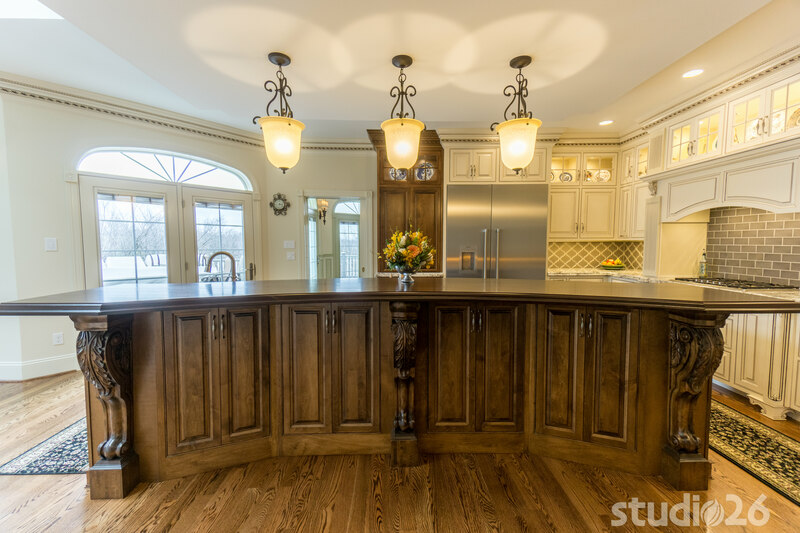 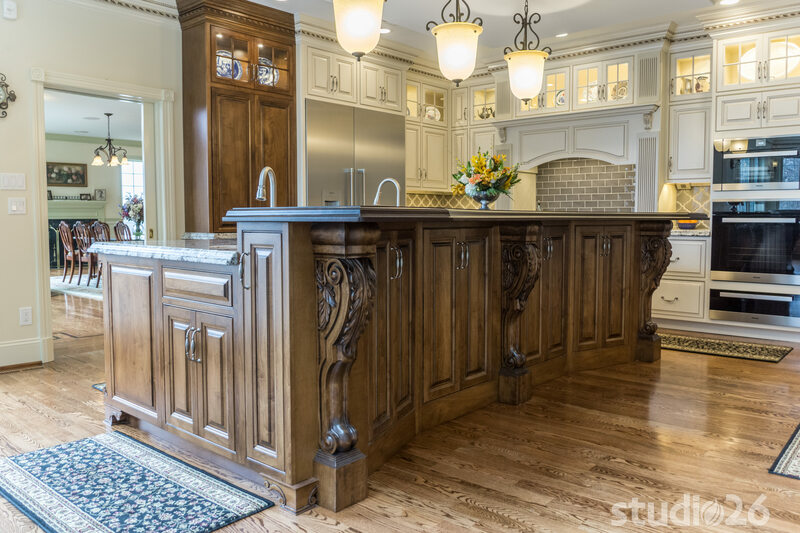 When conceiving a vision for the kitchen, our client was excited about the prospect of showcasing a French provincial aesthetic, which already can be found around parts of the rest of the home. 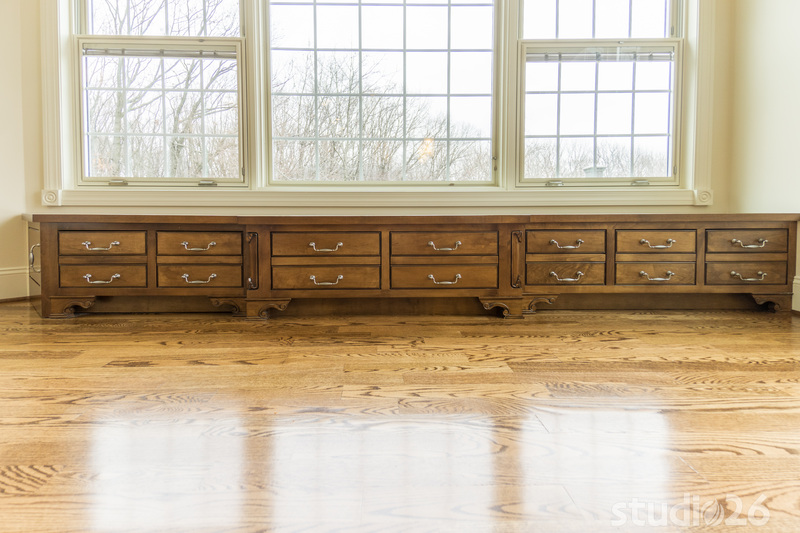 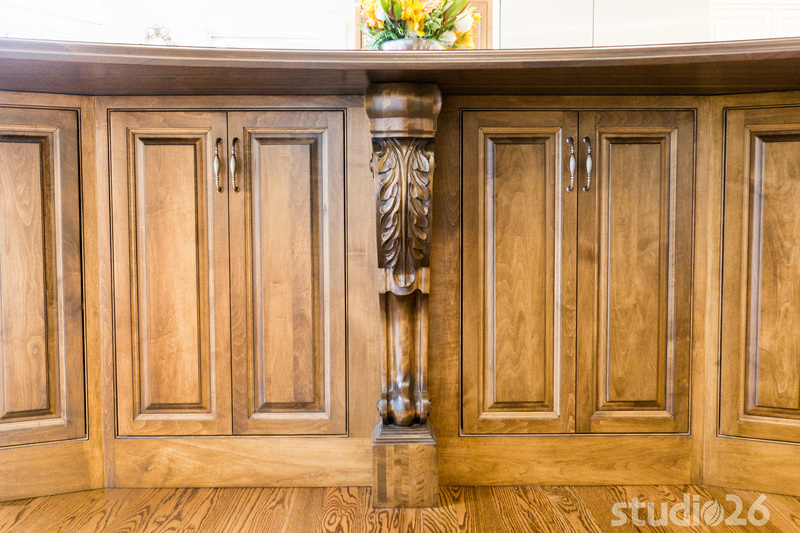 In the new design, these often ornate details cannot only be found in the custom cabinetry itself, but also in the lavish five-piece crown moldings throughout the kitchen and into the adjacent breakfast nook area. 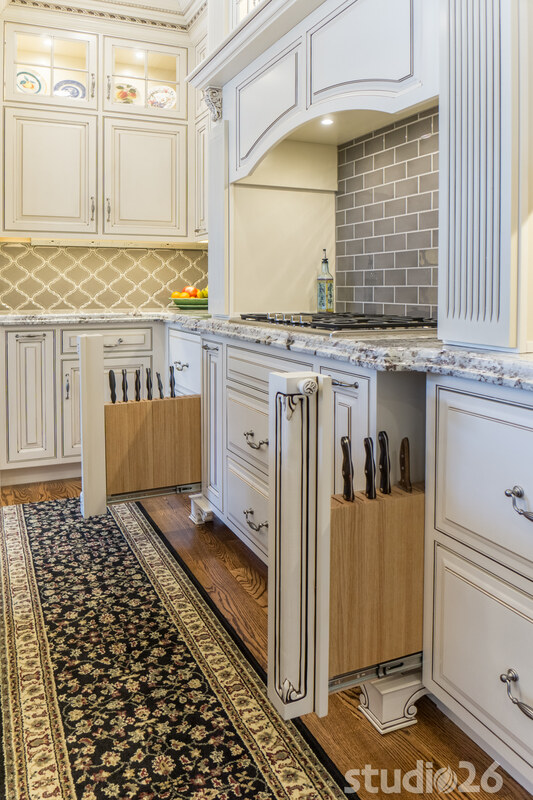 After much collaborative deliberation back and forth, our client decided to move forward with a potentially more risky decision in mixing painted with stained cabinetry around the kitchen – a decision we believe paid off in spades. 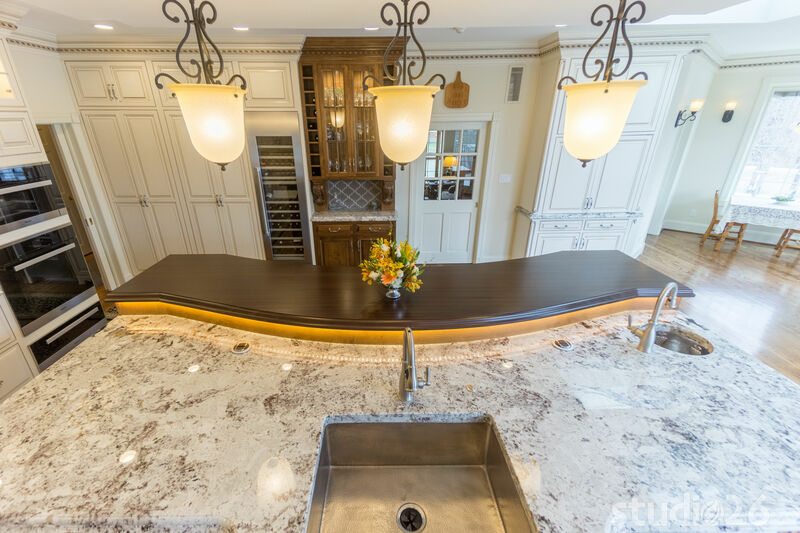 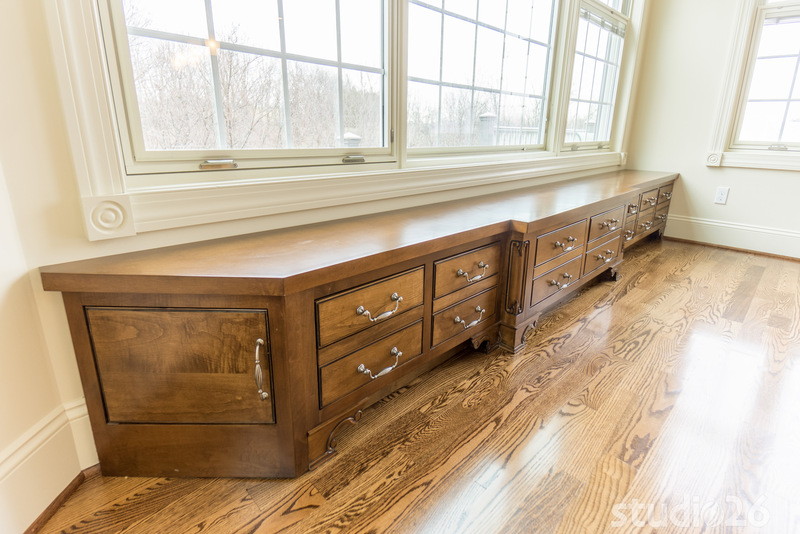 In addition to the entire island being stained, we were able to integrate two more furniture-like elements on flanking sides as visual anchors or bookends to the largely off-white, mocha-glazed (to help play off the brown stain) cabinetry that is dominant throughout. 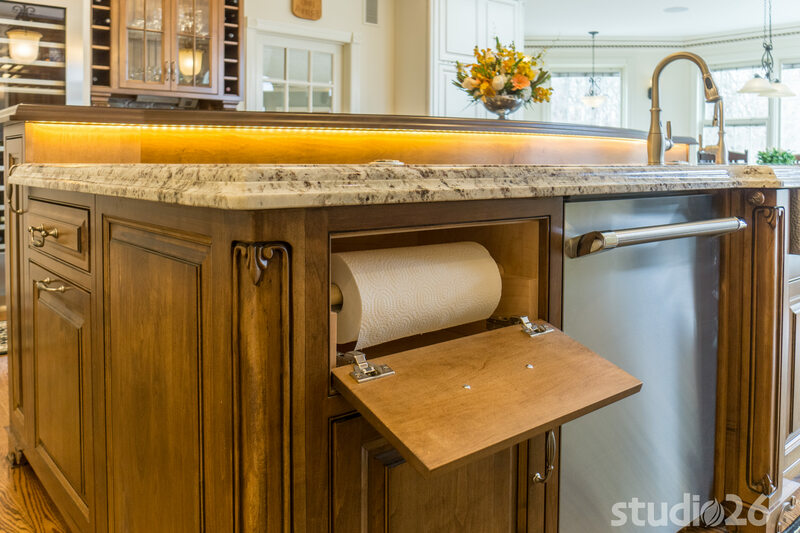 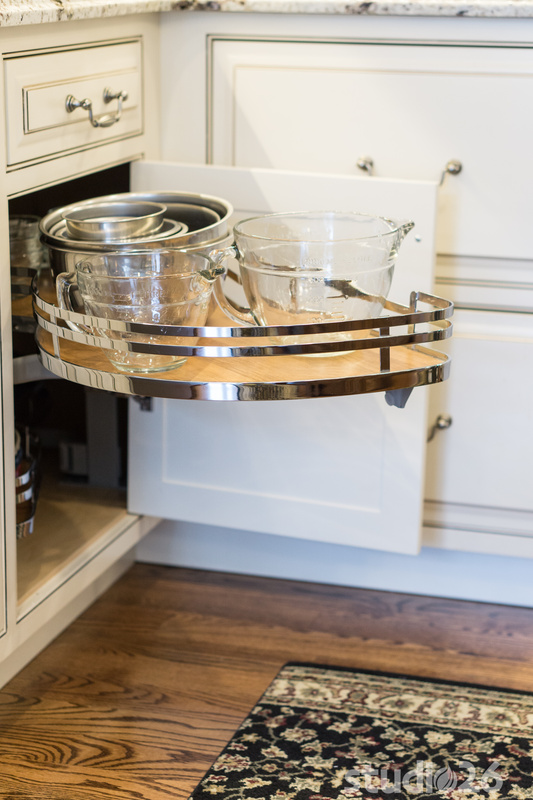 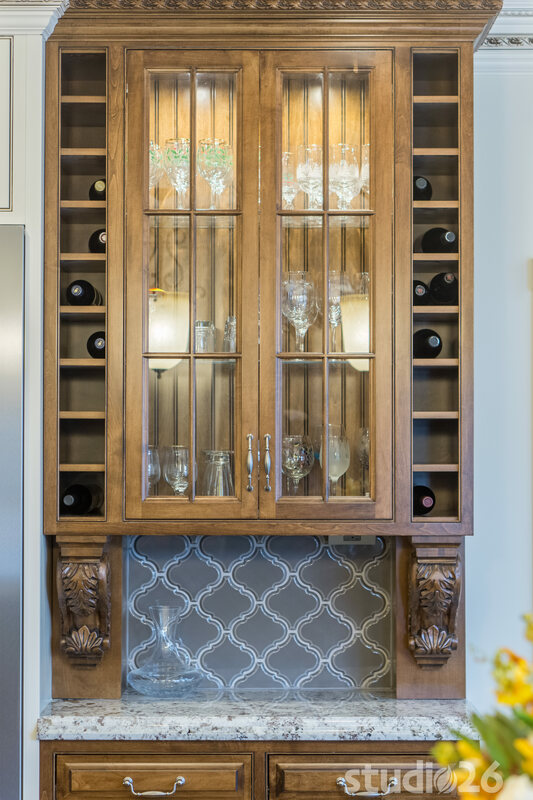 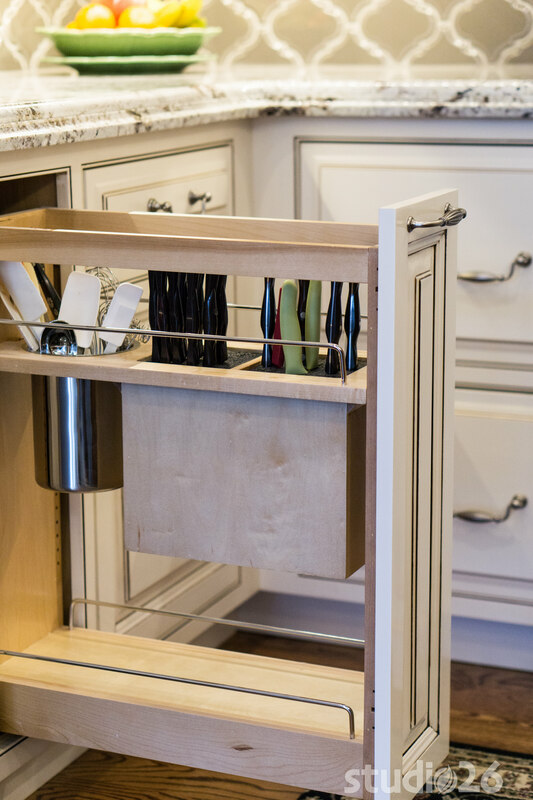 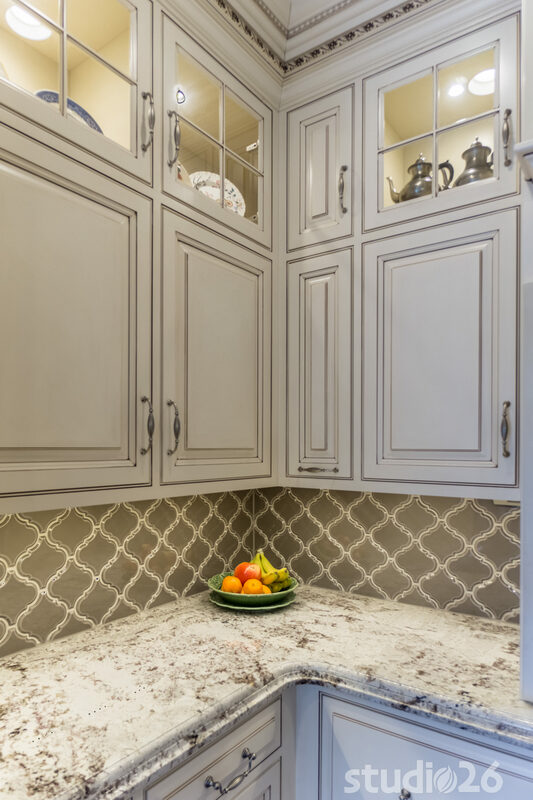 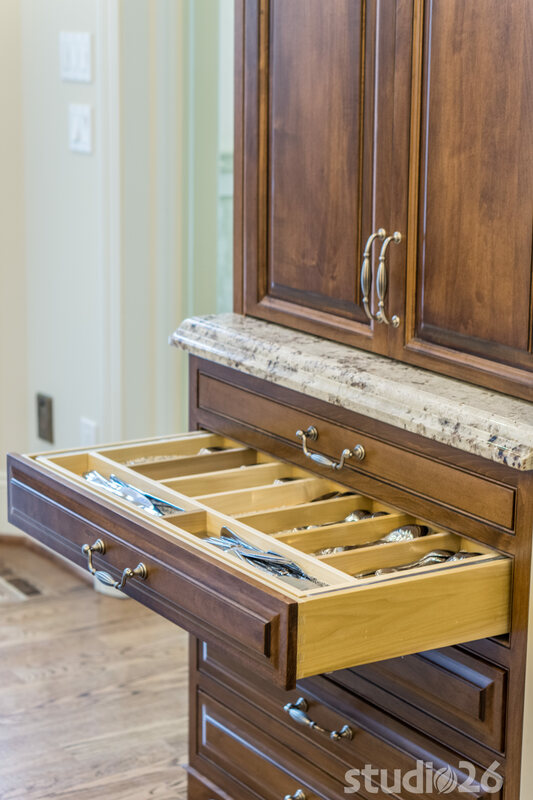 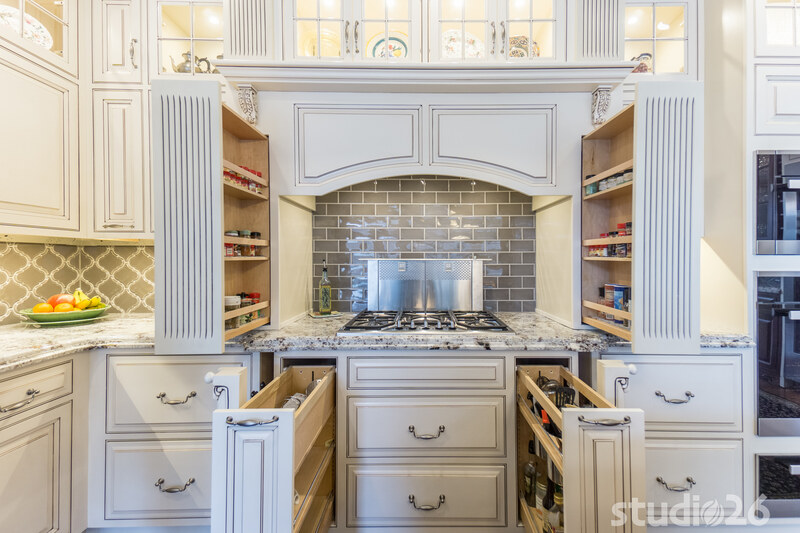 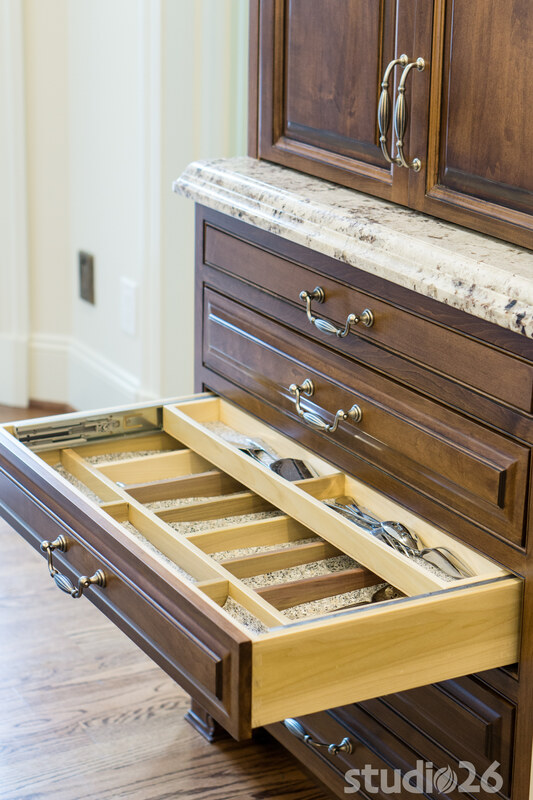 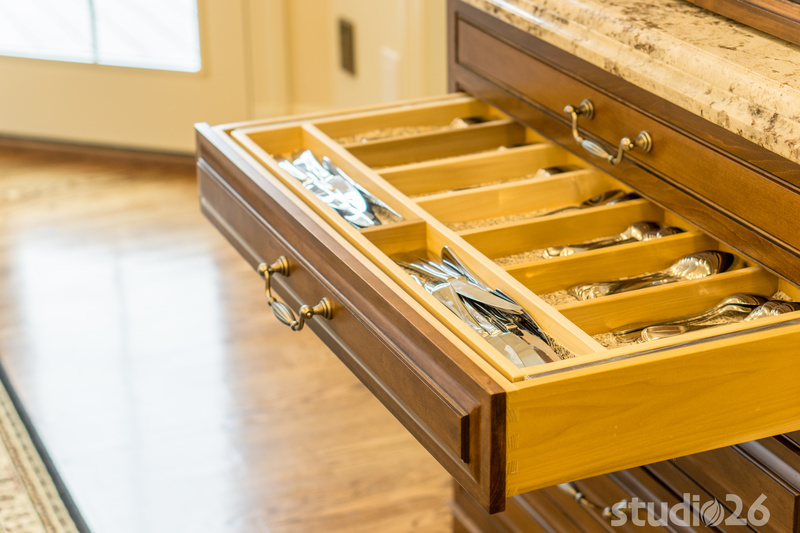 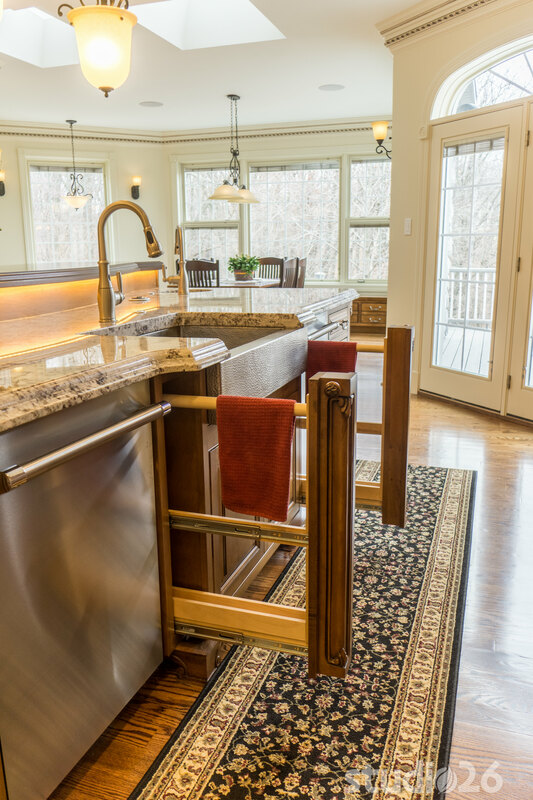 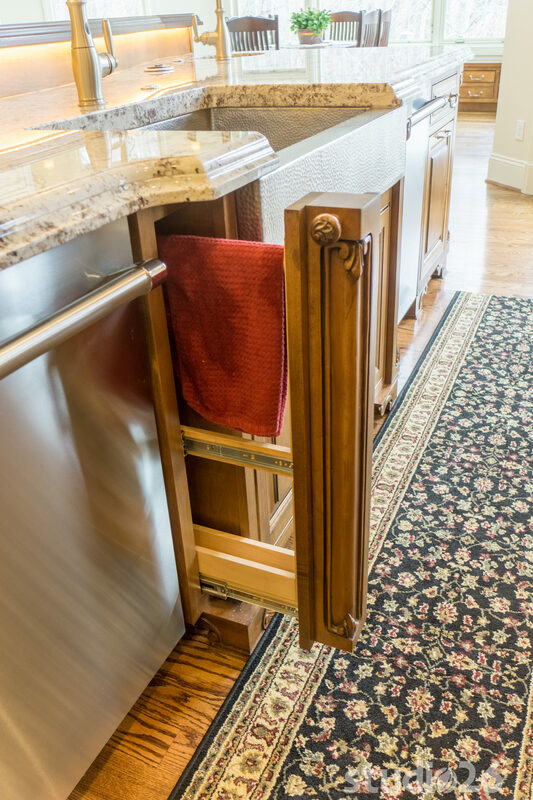 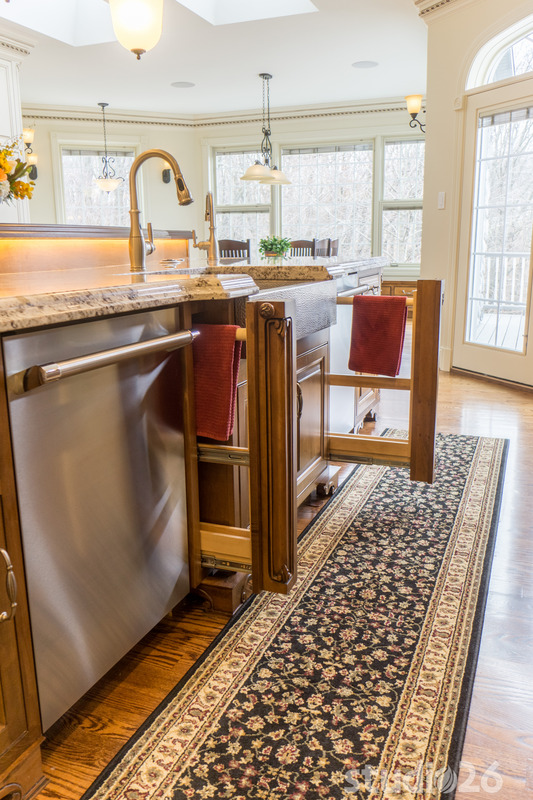 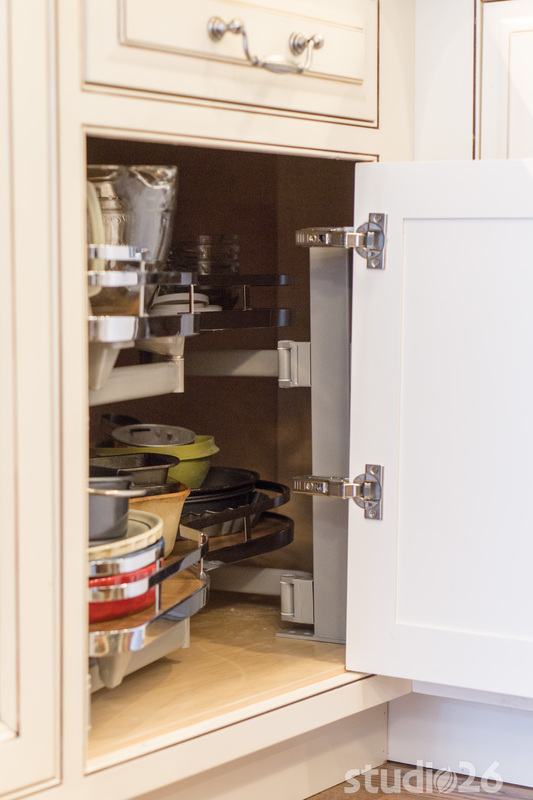 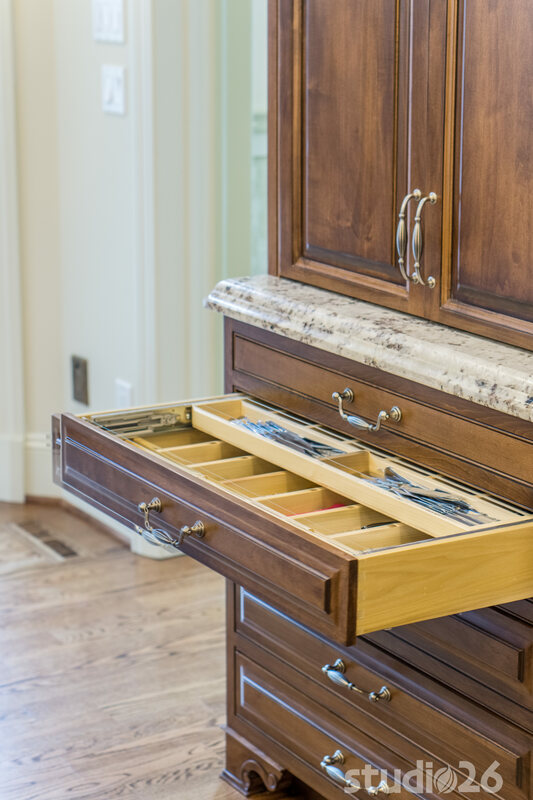 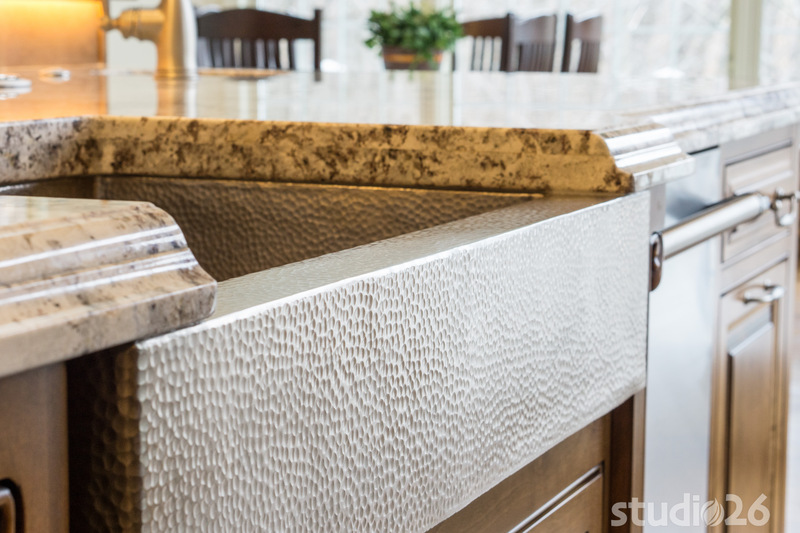 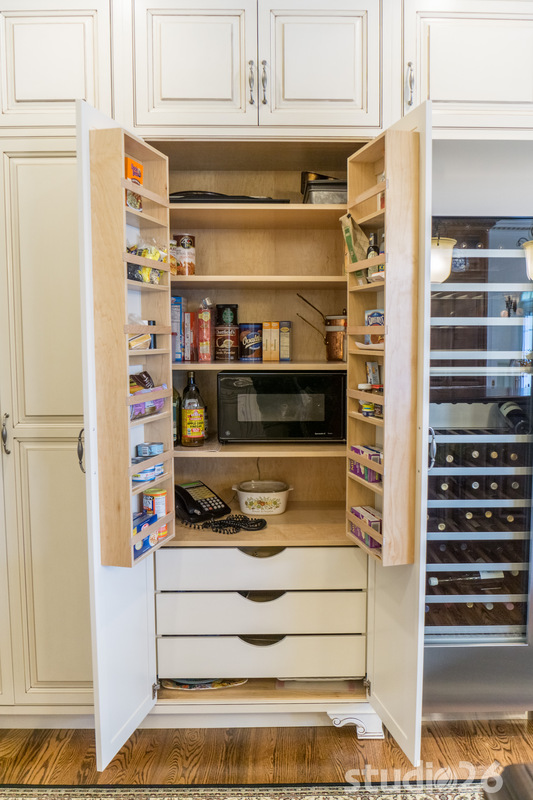 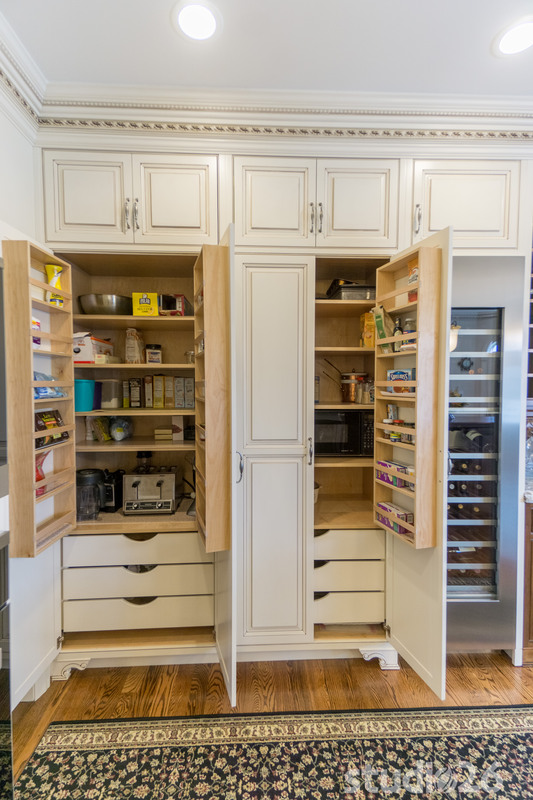 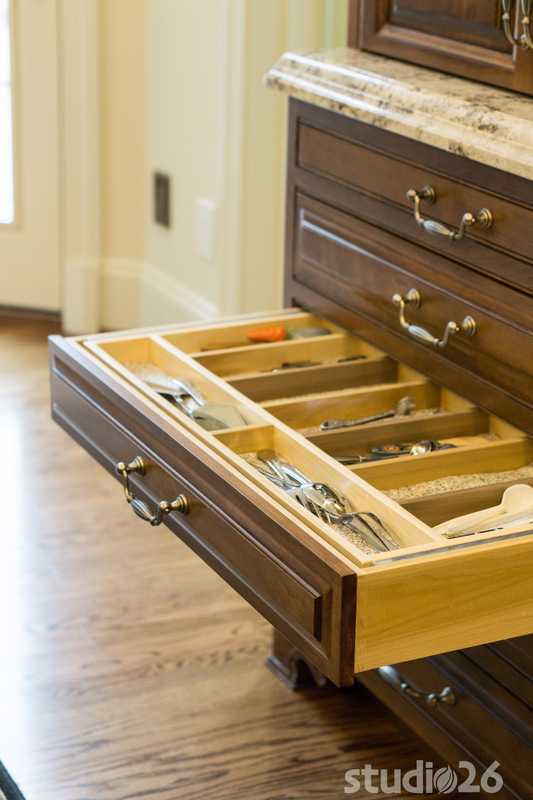 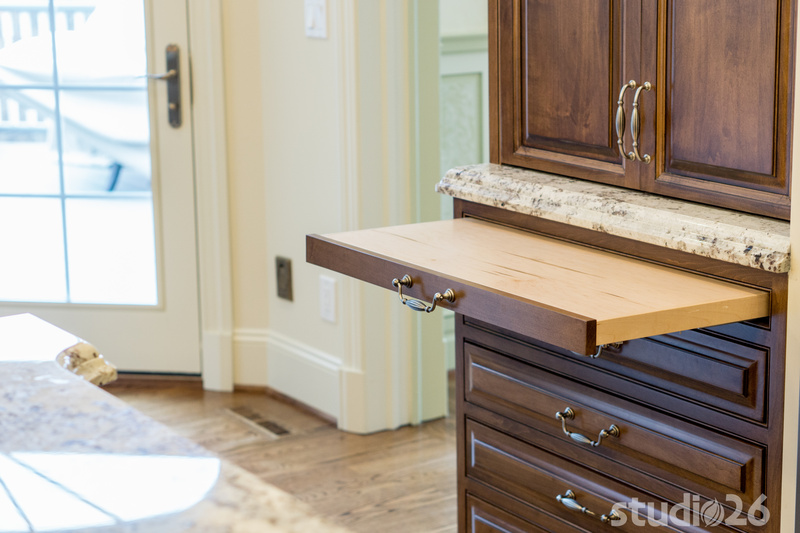 As we dove deeper into the kitchen design, we helped our client capture specific storage solutions that they had been desiring for quite a while – everything from typical pantry items and smaller appliances to hidden hideouts for hand towels, paper towels, and knives to name a few. 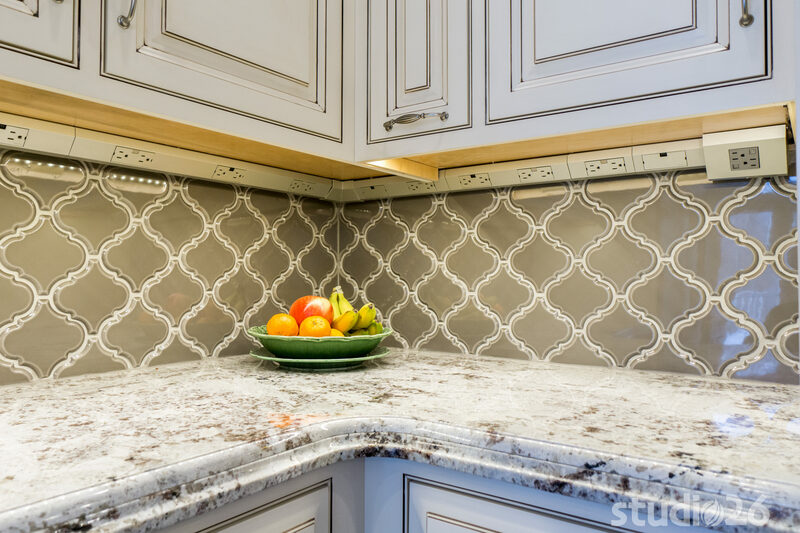 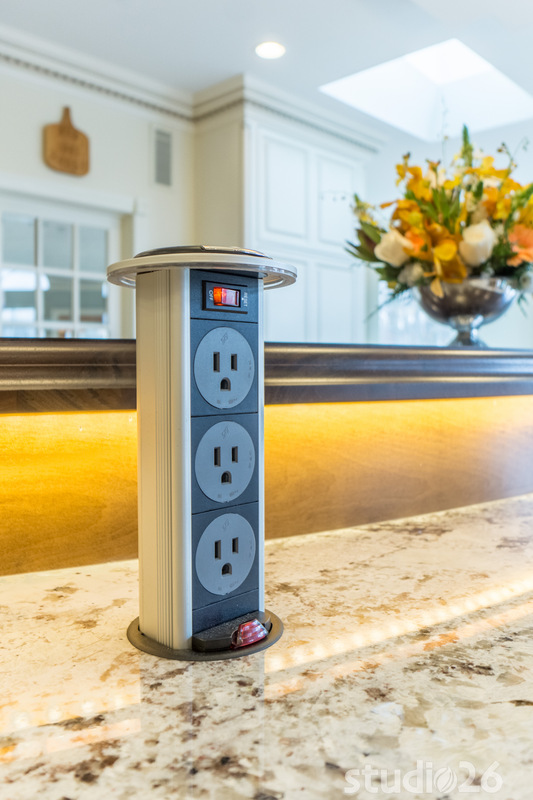 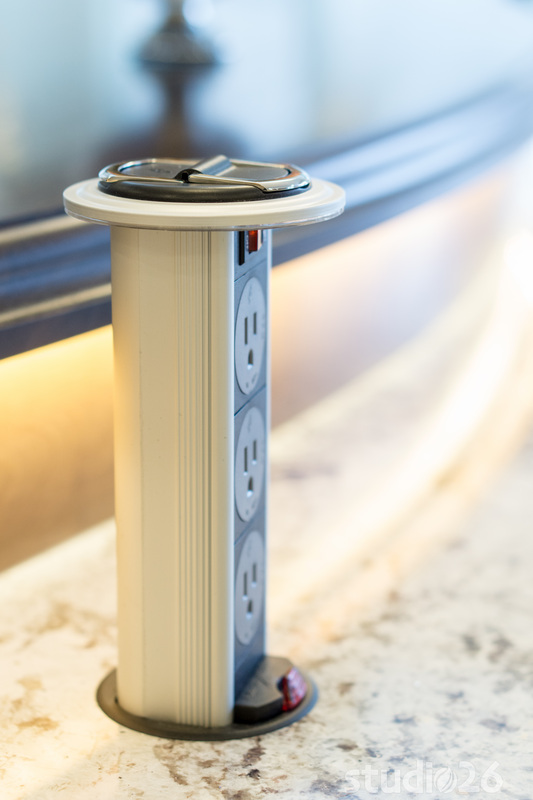 In an effort to maintain the inherent beauty of the alluring glass tile backsplash and the double-thickness granite countertops, we were even able to help minimize the visual impact of most of the kitchen’s electrical outlets by incorporating an undercabinet power solution around the perimeter and pop-up electrical towers in the island. 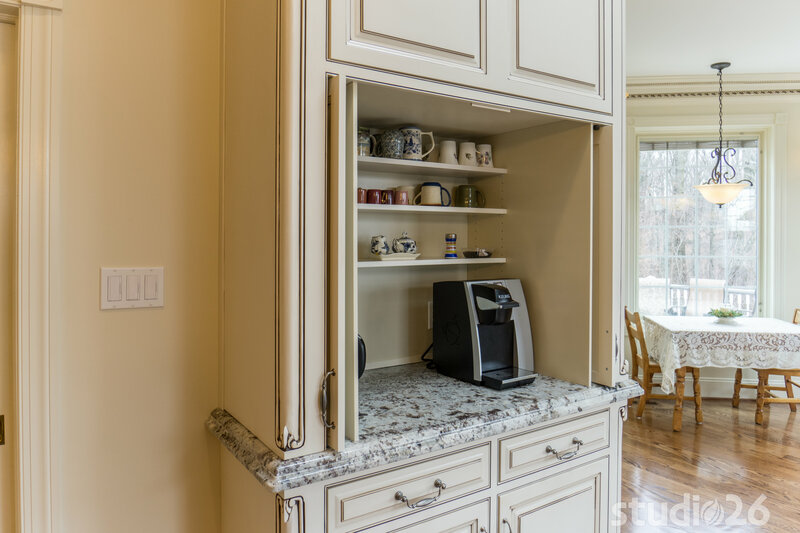 Also quite noteworthy is the hidden coffee station with recessed doors and the concealed TV area with remote-activated lift door. 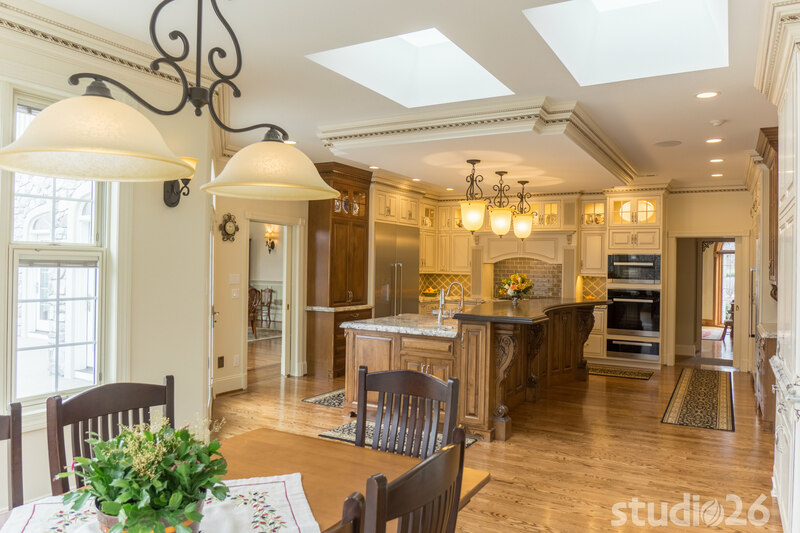 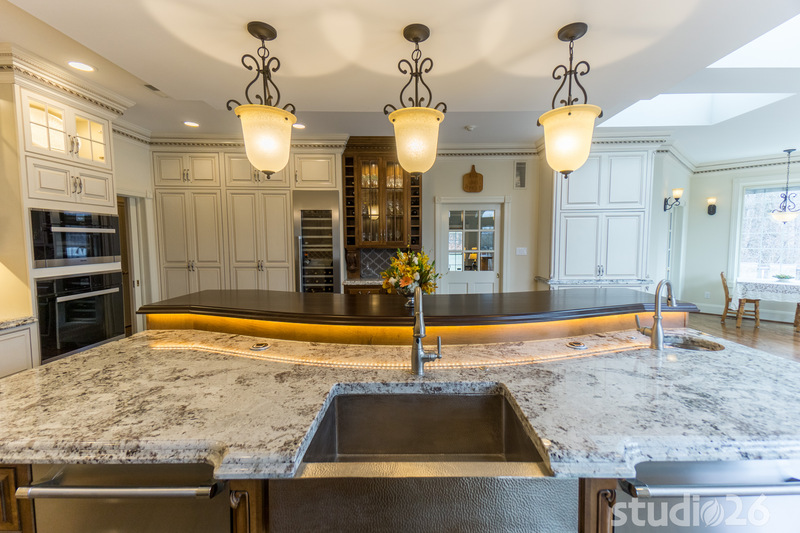 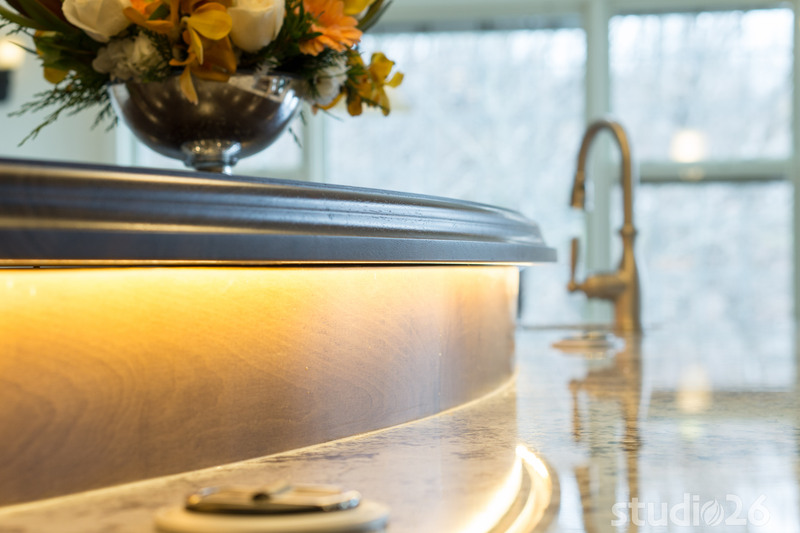 Innovative and beautiful lighting throughout help to further transform this space into something quite memorable for this family now and for many years to come!